A day-long presentation at the office, going grocery shopping, taking your kids to the park, fetching your clothes from the cleaners – there is no end to the day-to-day bustle. By the time you get home, your poor feet simply give up and desperately ask for some “me” time. We often ignore how overworked our feet are. They carry our body weight throughout the day, manage to fit into fancy but uncomfortable shoes, and suffer from shoe bites, corns, and calluses. It is quite common to overlook the hardships we put our feet through, and we do not take care of them like we should. An important part of this caretaking is keeping your feet well-moisturized. Since our feet lack oil glands, the skin can easily become hardened and cracked due to the constant pressure. There are some really amazing foot scrub recipes you can make for weekly exfoliation. But don’t forget, you also need a good foot cream. 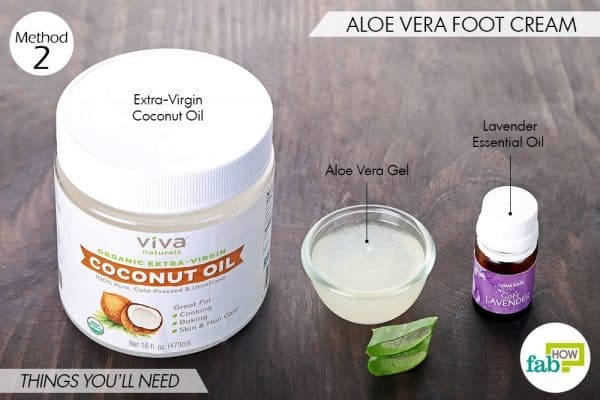 DIY foot creams use natural therapeutic oils and moisturizing ingredients to not only nourish your skin but also take away any pain. Plus, these ingredients are easy to find and the final product will cost a fraction of what you might spend on a commercial foot cream. These creams also serve as an excellent personalized gift for your family and friends. We bring to you the top two effective foot-cream recipes that will surely give you happy feet. Nothing can be more comforting than applying a cooling foot cream/balm on your tired and aching feet. This peppermint-based foot cream has the goodness of nourishing agents, such as coconut oil, shea butter, and sweet almond oil. Coconut oil, especially the extra-virgin variety, is loaded with healthy fatty acids that easily penetrate into the skin. Its antibacterial and antifungal properties will also help you deal with any foot infections as well as prevent them. The shea butter is rich in vitamins E and A that are great for maintaining healthy skin. The sweet almond oil also will help soften the skin and deeply moisturize it to prevent dry and cracked heels. Last but not least, the peppermint essential oil will leave a cooling sensation on your feet, relax the stiffened muscles and take away any pain. It is also a powerful antibacterial that will help prevent skin infections. 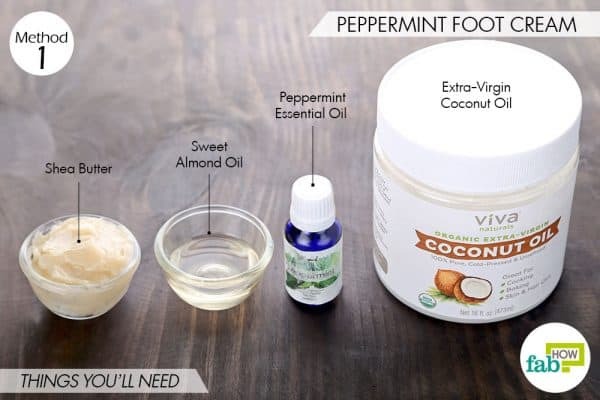 If you have excessively sweaty feet, incorporating peppermint oil in your foot care regime is a must. 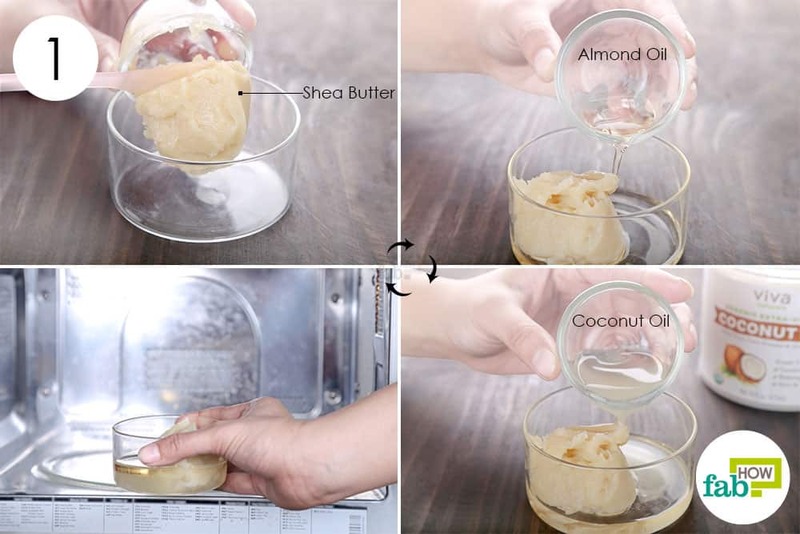 Put 2 tablespoons of shea butter in a microwave-safe container. Add 1 tablespoon of sweet almond oil to it. Add 2 tablespoons of extra-virgin coconut oil as well. Microwave the ingredients for 1 to 2 minutes until they melt completely. Take the container out of the microwave, and let the blend cool down to room temperature. Squirt in 7 or 8 drops of peppermint essential oil. Since essential oils are extremely volatile, any heat will render them ineffective. Therefore, it’s important to let the other ingredients cool down completely before adding the essential oil. 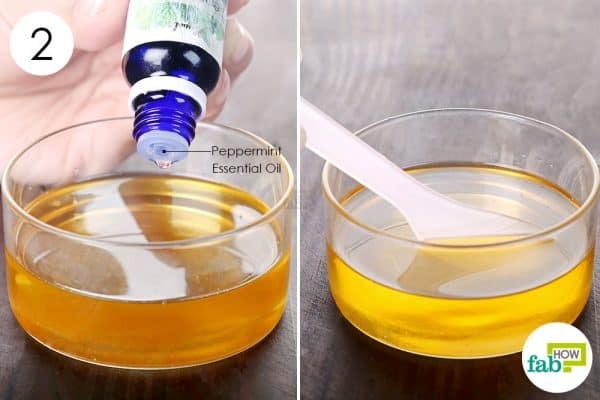 Stir well to dissolve the peppermint oil in the oil blend. Allow the ingredients to solidify completely. For quick results, you can place it in the freezer for 15 to 20 minutes to solidify. Use a hand blender to whisk up the solidified mix until it turns into a frothy cream. Transfer the cream to a shallow, tin can for storage. Clean your feet with warm water and apply the foot cream, covering the dry and cracked areas. Massage it well until it is completely absorbed into the skin. The shelf life of this peppermint foot cream is 3 to 6 months. Store it in a dry and cool place. This fresh-smelling foot cream recipe is nothing less than a tropical treat. It uses the richness of coconut oil, the soothing coolness of aloe vera gel and the relaxing fragrance of the lavender essential oil. 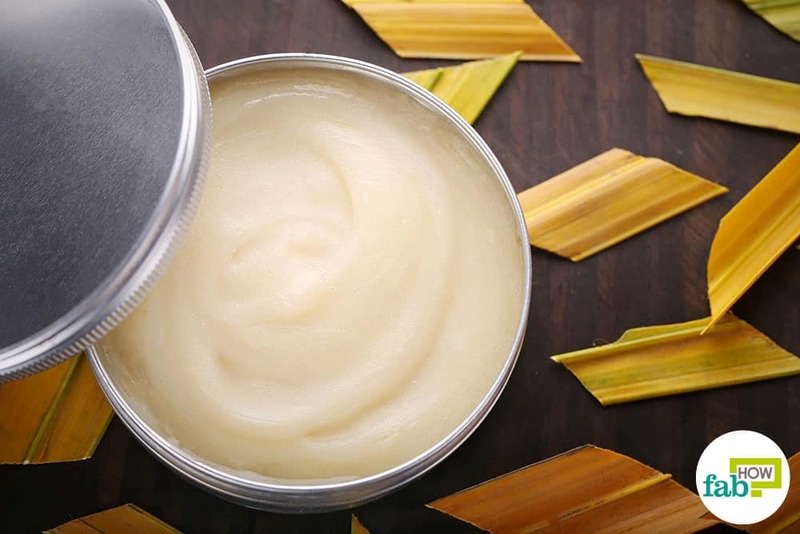 Fresh aloe vera gel helps take the heat off your overworked feet. It also brings with it plenty of vitamins and minerals that revitalize dull skin. The amino acids found in aloe vera also boost the body’s fibroblast cells to produce healthier skin cells. When used in a foot cream, it will enrich the skin and promote healing of any cracks in your heels. If you have an aloe vera plant or buy fresh leaves, you can learn how to extract your own fresh aloe vera gel. The coconut oil works better than any other oil in protecting the skin from infections and environmental stress. It forms a protective antimicrobial layer on the skin, while the lauric acid in it moisturizes dry skin. The lavender essential oil imparts a soothing fragrance to the cream and also relaxes your mind. It is also anti-inflammatory and will soothe any irritation. Plus, this oil helps extend the shelf life of your DIY foot cream. 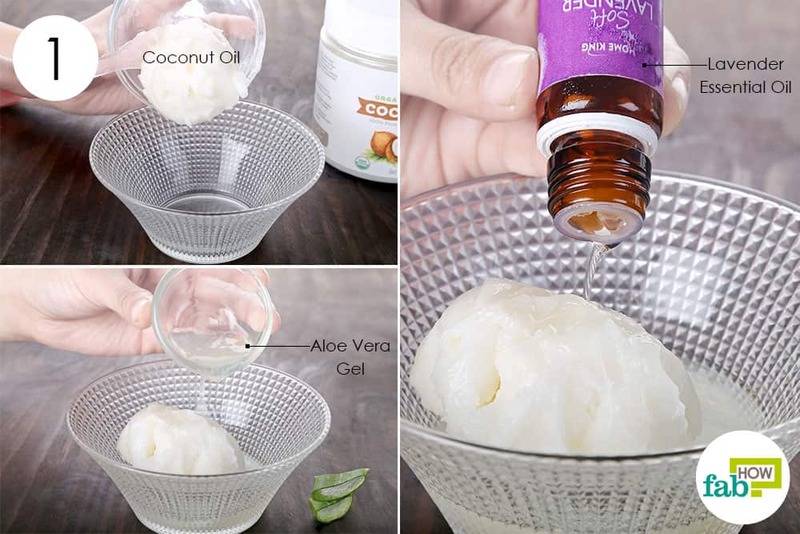 Put ¼ cup of extra-virgin coconut oil in a mixing bowl. The extra-virgin variety stays in a soft solid state, making it suitable for use as a cream. Add 2 tablespoons of fresh aloe vera gel to it. You can use packaged aloe vera gel in a pinch, but nothing can replace the effectiveness of the original clear gel. Add 5 drops of lavender essential oil as well. Use a motorized hand blender to whisk up the ingredients. This process will aerate the mixture and give it a creamy consistency. 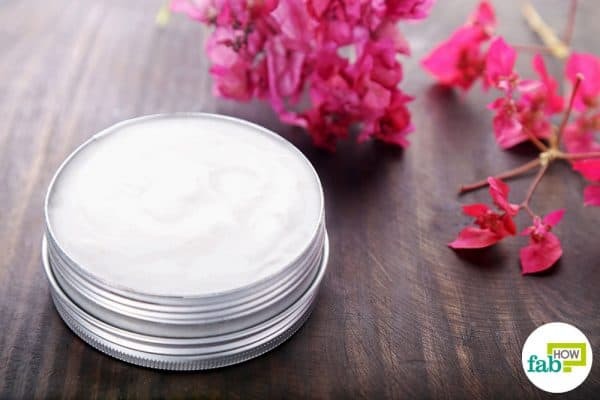 Spoon the DIY foot cream into a tin container for storage. Use it daily like any other foot cream to maintain soft feet. The shelf life of this DIY foot cream is comparatively shorter at about 2 to 3 weeks. This is due to the presence of fresh aloe vera gel that can spoil quickly. Store it in a dark and cool place. Apart from using your DIY foot cream, it is important to scrub your feet regularly to slough off the dead skin. You can try one of our homemade foot scrub recipes. Since the dead skin on your heels can be pretty hard, use a pumice stone to slough off the dead cells. If you have dry and cracked heels, slather a thick layer of foot cream on your heels at bedtime and put on your socks. Leave it on overnight and wake up to soft and healed skin. Always wash your feet when you get home after a long day. This will help get rid of accumulated dirt and impurities, preventing any buildup. Keep your toenails trimmed and filed to prevent nail infections. If you have extremely sweaty feet, always wear socks with your shoes. You can also apply some talcum powder before putting on the socks. This little hack will keep your feet dry throughout the day. Once a week, you can soak your feet in an Epsom salt bath. 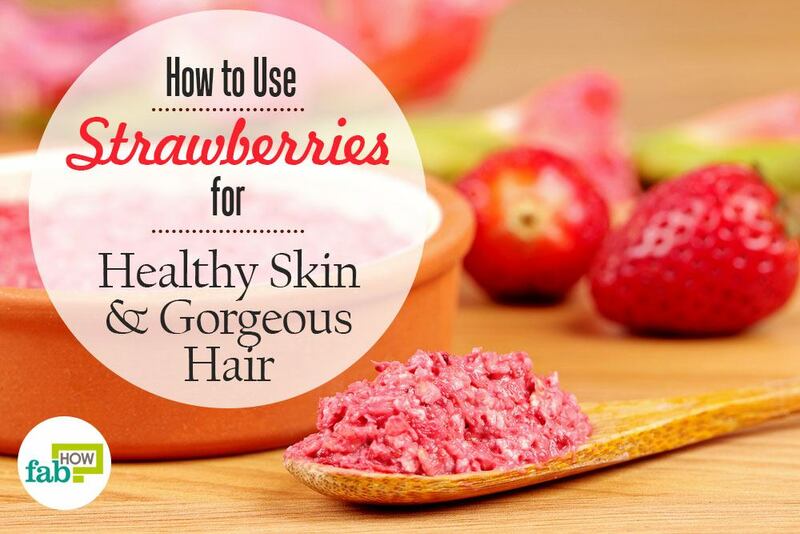 It will help soften the skin and also help get rid of toxins in your body. Protect your feet from extreme hot or cold temperatures to maintain healthy skin. What size of tins are you using? The tin containers are of the sizes of 2-3oz. You can get them easily online. Is there a substitute for beeswax, like soy wax? I want to keep the recipe as organic as possible and beeswax is not organic.